Home exercise	What is Sciatica? When you think you are suffering from the pain of sciatica; learning about sciatica will allow you to decide when you need to see the doctor. Understanding your condition will help you understand the evaluation and possible treatment options. True sciatica is caused by irritation of the sciatic nerve, and it most commonly causes pain in the buttock that may radiate into the thigh and lower leg. Other symptoms of sciatica, besides pain, may include numbness or weakness in the lower extremities. The pain of sciatica is a pain that runs through your buttock and thigh, but many other things besides sciatica can cause pain that area. Hip arthritis is a common condition that is often confused with sciatica. Other possibilities include sacroiliac dysfunction, trochanteric bursitis, and degenerative disc disease. These can all cause pain in your buttock and thigh. The pain and other symptoms of true sciatica are often difficult to separate from other possible causes because: 1)The structures involved are very close to each other. 2)Injuries or inflammation in these areas that are very close to each other can all cause similar pain. 3) All of these possibilities may occur simultaneously. You may have more than one condition contributing to your pain and other symptoms. The sciatic nerve is the largest nerve in your body and it runs from your posterior pelvis through your buttock and thigh. It is formed by the joining of several nerve roots after they exit the lumbar spine. In the lower part of your thigh the sciatic nerve separates into the smaller nerves that control your lower leg and foot. 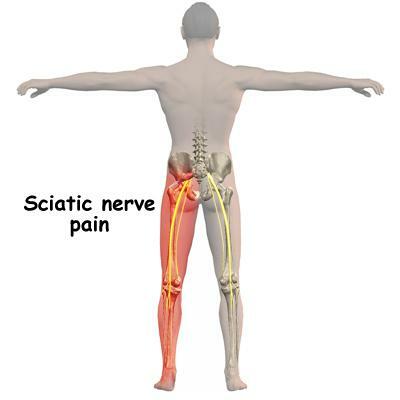 Any irritation of the sciatic nerve, or the nerves that make up the sciatic nerve, may cause the pain of sciatica. The most common cause of sciatica is pressure on the nerves in the spinal canal. Anything that presses on the nerve roots that form the sciatic nerve can cause the pain of sciatica. Conditions within the lumbar spine such as a herniated disc, spinal stenosis, or a spondylolisthesis may cause sciatica. 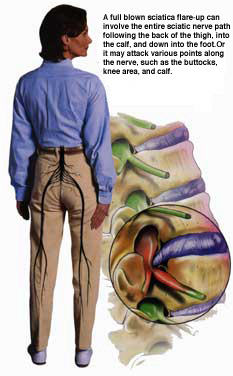 A common cause of sciatica that occurs outside of the lumbar spine is piriformis syndrome. This is a difficult condition to evaluate and treat because there are no specific tests or imaging studies to diagnose piriformis syndrome. Piriformis syndrome is thought to occur when the piriformis muscle puts pressure on the sciatic nerve. The piriformis muscle is one of the muscles that controls your hip and it lies over the top of the sciatic nerve. If the piriformis muscle becomes short and tight, or goes into a spasm, it can put pressure on the sciatic nerve causing the pain and other symptoms of sciatica. The most common symptom of sciatica is pain but you may also have areas of numbness or muscle weakness in the lower extremities. You may have buttock pain that radiates into the thigh and lower leg. There may also be lower back pain associated with sciatica. The severity of your symptoms is often proportional to the severity of your sciatica. Pain may be only mild and annoying or it may be severe and prevent normal activity. Minor loss of sensation may progress to difficulty feeling the floor and problems controlling your legs. Lower extremity weakness may begin with difficulty rising from a chair, but as your sciatica progresses, you may find yourself tripping and falling more often. In extreme cases your legs may completely give out making it unsafe for you to walk without assistance. Anytime your symptoms are more than just barely noticeable you need to be evaluated by your doctor, and the earlier the better. An early evaluation of your sciatica makes the treatment options much more palatable. Evaluation of your sciatica must include evaluation of all of the other structures in that area to check for other possible causes. X-rays of the lumbar spine may reveal arthritis in your back contributing to your symptoms. X-rays of your hips and pelvis may reveal degenerative joint disease of the hips or sacroiliac joints. Examination by your doctor may reveal tenderness or other signs of trochanteric bursitis. After your initial evaluation if your doctor suspects spinal stenosis or lumbar disc problems, he may order an MRI of your lumbar spine. Sometimes a diagnostic steroid injection may be ordered to determine the cause of your symptoms. If a steroid injection in the lumbar spine, or the hip, or the sacroiliac joint makes a difference in the way you feel. That may be a good indication of what is causing your symptoms. If the MRI, x-rays, and steroid injections do not reveal anything that may be causing your symptoms, your doctor may consider piriformis syndrome as a diagnosis. A trial of physical therapy for stretching and strengthening exercises may be ordered to see if it changes the way you feel. Mild cases of sciatica may respond well to anti-inflammatory drugs, weight loss, and activity modification. Over the counter medications such as ibuprofen or naproxen can relieve pain and reduce swelling. General conditioning and weight loss can strengthen muscles and improve your posture. Practicing good back mechanics, and avoiding bending and lifting, can reduce back pain and relieve swelling that may be pressing on nerve. More severe cases may be treated with a series of steroid injections to relieve pain and reduce inflammation. In many cases the response to these injections is very variable with some people getting no relief and others getting complete relief. There is very little risk or downside to a trial of injection therapy so it is often the next step in treating your symptoms. If there are dramatic findings on your x-rays or MRI and your symptoms fail to respond to less aggressive care you may be referred to a surgeon. If your doctors think degenerative joint disease of your hip is causing your symptoms you may send you to be evaluated for a hip replacement. If your studies seem to indicate spinal stenosis or other problems in your back you may need to see a spine surgeon. The pain and other symptoms of sciatica can present a confusing picture, but a methodical evaluation and trial of conservative therapies can often provide good relief. Conditions that do not respond to simpler methods may require more aggressive treatment. Seeing your doctor for an evaluation while your symptoms are mild improves your chances of relieving your symptoms and avoiding the more invasive treatment options. So if you have, or think you have, sciatica make an appointment to discuss your symptoms with your doctor. This article really taught me a lot about sciatica. I thought it was just a little back pain. Thanks for all the information! Thank you for visiting, Mackenzie Jordan. Glad to be of help. Thank you, Mackenzie Jordan. Glad to have been of help.